and to partake of refreshments. Mid Behr, Dr. and Mrs.
stock, Mrs. Lillian Berni. Mr. and Mrs.
and Mrs. Jan Bresky, Mr. and Mrs.
Mollie Emple, Dr. and Mrs. Irwin Entel. Mr. and Mrs. Mel Estroff, Mr. and Mrs.
Fins, Mr. and Mrs. Roland Fox, Dr.
Mrs. Lewis Gross, Mr. and Mrs.
Kramer, Mr. and Mrs. Larry Krug, Dr.
and Mrs. Philip Lerner, Dr. and Mrs.
after 2,500 years of isolation. St. Petersburg, both at 7:30 p.m.
guest speakers at the rallies. Ethiopian Jewish children in Israel. latest effort for Jewish survival." Fund of Central New Jersey. Temple B'nai Israel at 7:30 p.m.
in this land," Theodore R.
meeting at the Fairmont Hotel. Ben Bush is the chairman. advocate of the adult living plan. with issues concerning the aged. adult living care," Jones said. showed he was really Mengele. from Canada to do so. General Counsel Darrell Peck. The announcement! case on his own initiative. P.O. Box 88. Dunedin, Fla.
Passover Seder table. It spans ^ fF1. by Rabbi Dr. Joseph I Sinner k Rabbi Solomon B Shapiro. Manischetiu Win.- Co.. .V York, y V llili . s work run so smoothly. Pus Lovitz, Rabbi and Mrs.
*a Mokototf, Mr. and Mrs.
and Mrs Roger Rolfe, Dr.
fies Rutenberg, Dr. and Mrs.
MM Mrs. Steve Sembler, Mr.
parties Shapiro, Mr. and Mrs.
p. James Soble, Dr. and Mrs.
man, Mr. and Mrs. Hy Weintraub, Mr.
and Mrs. Sidney Werner, Mr. and Mrs.
him at his office in St. Contact your Travel Agent or call (TOLL-FRr-h). paid. Out ol Town Upon Raquast. Egypt emerge as a major U.S.
indeed, will have his won"
Wednesday. March 20, at 8 p.m.
i kind, instead "' "1U'"' ''u' crowd. on Sunday. March 17. at 1 p.m.
"best sellers" to self-help books. Michael Marrus and Robert O.
Jews" by David S. Wyman. March 20 to B'nai Israel in St.
Sara Mandel leads Valentine's Meir Friendship Club. at our eloga n t facility or yours. Itical aides even more so. York Times in early February. arms sales to Saudi Arabia." told a House subcommittee Jan.
and caring staff With massage. Jan. 3 at 8 p.m.
AND SAVE UP TO $1000! We welcome you to open a Revolving Charge Account. ould be of interest to them. If speech to constituent groups,"
hraeliperformers contributed to the festivities. The NEW Vanderbilt Inn on the Gulf is for family fun . "ve entertainment in the Gangplank Lounge. St. North, St. Pete. 381-8111. 8167 Elbow Lane North, St. Pete. finished in a few months. Sisterhood. Mazel tov to Mrs.
soring a Purim "Phantom Ball." limited so reserve by March 25.
to the level of the young child. Sunday, March 31, at 12 noon. will be held March 10 at 10 a.m.
Country Club on March 14. 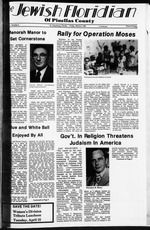 Jewish War Veterans Victor L.
Post now as charter members. Registration and coffee 9 J.
Shrager of the Jewish Federation! 59th St. North, St. Petersburg,! Morning Sabbath Service 1* a.m. Bar Bat Mltsvah Service 11 am. SahhHth Servlr- Vrtrinu unt B n m Saturrlav.Ba.nl rel.'-**"
. Rabbi Jacob Luskl <*nWr'"
1MB 8. Belcher Rd.. Clearwater SS61S Rabbi Arthur B**ejn*.'Mf). Services: Friday evening at 8 p.m.: Saturday 10:S0a.m. t Tel." P.O. Box 117S, Dunedin SUSS 1878 Curie* kg., rmu- -""
s Tel. SM-4781 or 7S7-SXM. |bers will present a skit. Ipnl 1 Election of officers. En to be used toward a van. ch 19 Myths of Stress. turn by Art on Wheels. La. N., St. Pete, at 3 p.m.
99 against or 17 votes short. PRE NEE0 CONSULTATION AND PREPAID. And El Al is the only airline that flies direct from Miami to TeiAviv. Wednesday, March 20, at 8 p.m.
course, racquctball. boating, fishing and so much more. ^ kind, instead of one <>t the crowd. , thai lives up to .ill vour expectations. I he Killsview.